Legend Bernard Hopkins defied the odds once again Saturday night by defeating yet another young lion and capturing yet another world title belt, this time at the astonishing age of 48 years old. Hopkins' 12-round unanimous decision over Tavoris Cloud at the Barclay's Center in Brooklyn, NY, not only made the North Philadelphian the IBF light heavyweight champion, it made him the oldest man in boxing ever to win a major world championship. 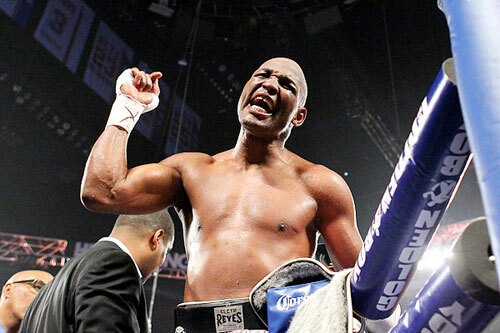 The previous record of 46 was held by none other than Bernard Hopkins. Bernard's performance against Cloud was another jaw-dropper. Spotting the dangerous and previously undefeated champ 17 years in age (48 vs. 31), Hopkins preceded to once again impose his amazing mental powers on a younger foe, somehow rendering him almost completely impotent and unable to keep up with the middle-aged phenom during the fight. Hopkins out-boxed and somehow outworked Cloud to win 8 of the 12 rounds on my card and took the unanimous verdict by scores of 116-112 (twice) and 117-111 on the official cards. The fight was a typical golden-years Hopkins performance. He used masterfully effective but subtle tactics that have become his trademarks of late - jabs, clinches, and that measured pace - to bring Cloud's game plan to a screeching halt. At times the fight was like watching a slide show with both fighters on pause and Cloud's chances slipping away in slow motion. But Hopkins also managed to walk through the handful of bombs thrown by the defending champion, and even landed his own showy and jarring right hand leads. The end result was another incredible showing by Hopkins who has forged a most unlikely twilight chapter in his already rock-solid legacy. Again he managed to hypnotize another top-notch fighter in his prime into ceding his championship belt without a fight. It is clear that Hopkins possesses unequaled physical gifts that have allowed him to maintain the high level of ability he displays these days. But even more credit for his success is due to his mental strength and ring intelligence. These are the tools that have made Hopkins the legend he is. That muscle between his ears has not softened one bit with age. A smart fighter all through his career, Hopkins has become more and more brilliant with each passing birthday. Even in his prime, Bernard's fights were rarely thrilling to watch. They were more tactical skirmishes than all-out wars. But he was always tough, well conditioned, angry, edgy, and extremely skilled. Now in this final chapter of his career, the fights have become even less entertaining - mostly quiet, strategic affairs predicated on minimizing the action and eliminating anything that could possibly make a highlight reel. But make no mistake, Hopkins is a great fighter, still doing great things. Hopkins is a marvel who somehow keeps getting more marvelous. He has probably already accomplished enough to make him Philly's greatest champion on most all-time lists, and he's clearly not finished yet.